We interrupt the barrage of zucchini recipes, to bring you roasted broccoli with sesame dressing. I’ll admit it. I needed to branch out to other green vegetables and this recipe made switching things up very easy. I know it’s good for you. 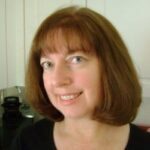 (Check out this article on Broccoli’s Benefits in Preventing Arthritis.) But, I’m not enthused by plain, steamed broccoli. On the other hand, caramelized broccoli that’s been roasted until it’s nice and crispy and is drizzled with something special…a mixture of sesame oil and seasoned rice vinegar…will be gobbled right up. Toasted sesame seeds just make the presentation more festive. 1. The first step is broccoli preparation 101. Cut the broccoli florets from the hard stalk. I estimate, on average, that 1 pound of broccoli will yield approximately about 4 cups of florets. 3. Spread the florets out on a baking sheets and season with salt and pepper. 4. Roast the broccoli florets in a 400 degree F oven for about 15-20 minutes. The edges should just begin to brown. I checked on them half way through and moved them around a bit. 5. While the broccoli is roasting, make the sesame dressing. 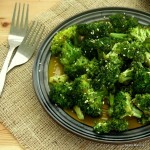 For every 4 cups of broccoli florets, stir together 2 Tablespoons of seasoned rice vinegar and 1 teaspoon of sesame oil. 6. Toast the sesame seeds, if desired. To do this, place a Tablespoon of seeds in a non-stick frying pan (don’t coat it with any oils, etc.) and cook over medium heat for a few minutes (3-5) or until the seeds become fragrant and begin to brown. Constantly move the sesame seeds in the pan so they don’t burn. 7. 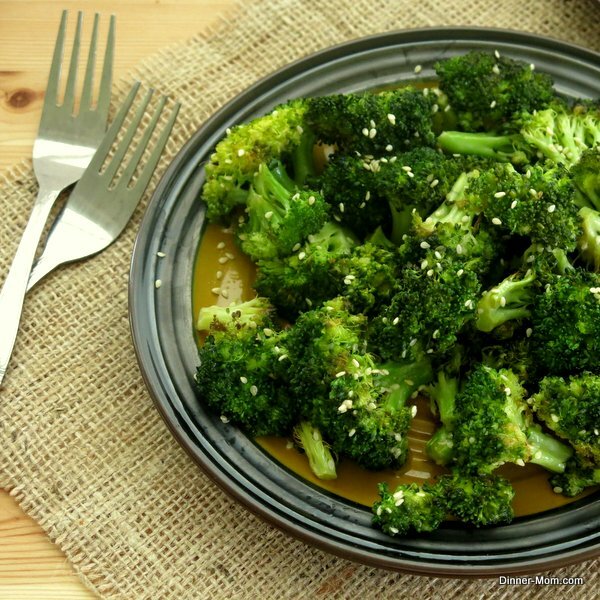 Remove the roasted broccoli to a serving dish and toss with the sesame dressing. Sprinkle the sesame seeds over the top. 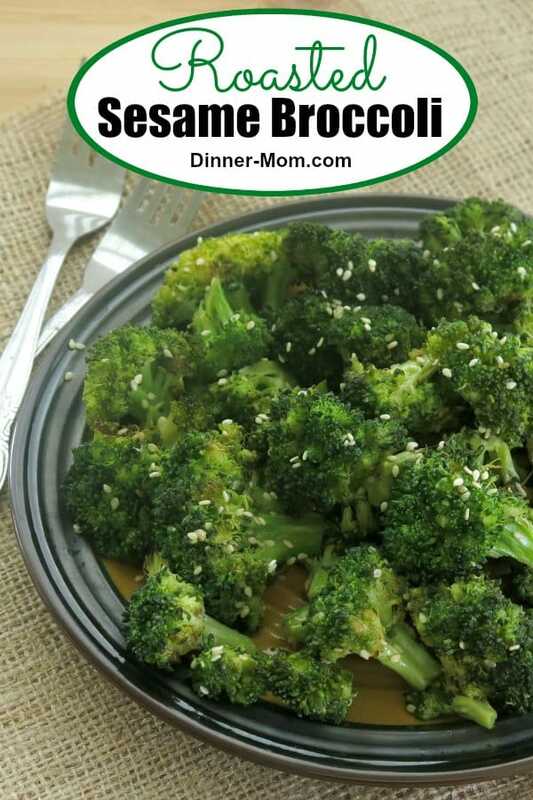 This roasted broccoli with sesame dressing recipe was developed as a side dish. But, I had some leftover shrimp on hand and it was the perfect pairing. Add chicken, shrimp, lemony baked basa or the protein of your choice and you’ll have an easy, delicious, low-carb entree. Roasted broccoli with sesame dressing and toasted sesame seeds is the perfect low-carb and healthy side. Or, add some shrimp or chicken and it's a meal! Cut broccoli florets from stalk. Toss broccoli florets with olive oil. Place florets on a baking sheet and sprinkle with salt and pepper. 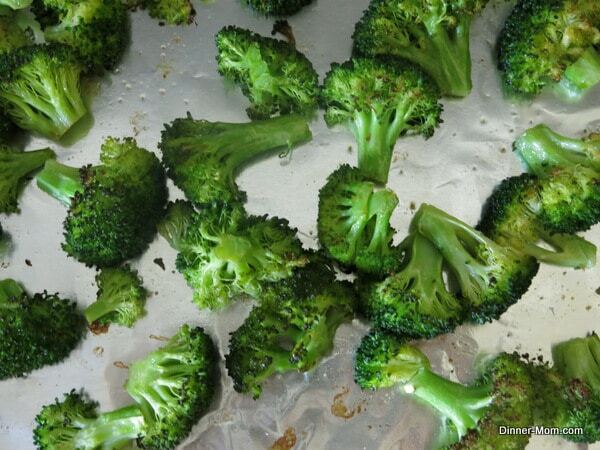 Roast for 15-20 minutes or until broccoli is crisp and begins to brown on the edges. Remove broccoli florets to serving bowl. If desired, toast sesame seeds by heating in non-stick pan for about 5 minutes or until sesame seeds begin to brown and are fragrant. Stir rice vinegar and sesame oil together and drizzle over broccoli. Add some protein, like shrimp, chicken or tofu and it's a healthy, low-carb meal. 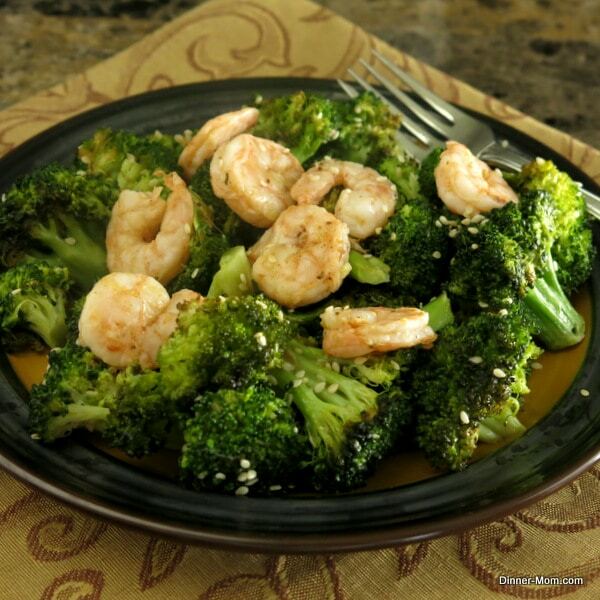 I love roasted broccoli and the addition of the sesame oil will really make me happy!